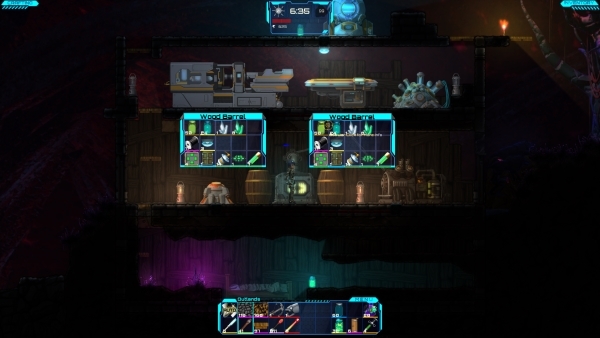 In the wake of success from survival builder games like Minecraft and Terraria, it only makes sense that someone would work to improve on the already-addictive formula. 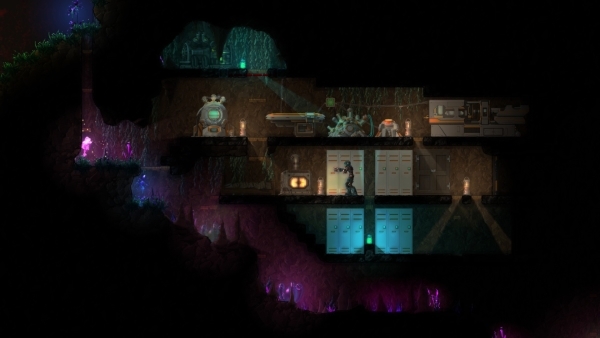 Enter Allgraf and their science fiction bend on the Terraria model, Darkout. Is it a bright new light on the action–adventure genre or should it be stashed in a dark corner and forgotten? Let’s find out. There is a story to Darkout, though the true meat of it is hidden deep behind a series of recordings you’ll have to find and listen to. The overarching narrative, though, is that humanity is in imminent danger (of course). Stationed on a massive ship in outer space, your escape pod is suddenly jettisoned to the surface of an unknown planet, and you must survive using the tools on your escape pod, whatever you can salvage from it, and the world around you. 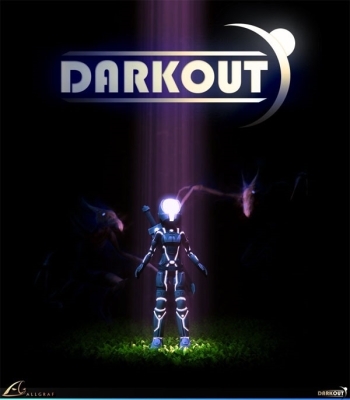 If you’ve played games like Minecraft and Terraria, you will likely pick up on the basic controls and concepts of Darkout fairly quickly. At its heart, you are digging, mining, and chopping to collect materials that allow you to upgrade and explore ever deeper into the planet you’re on. When you first crash land, the game tries to give you a very basic tutorial and some supplies. Once you grab the supplies on your pod, you’re instantly able to dig, mine, and chop anything in your path. It makes the game’s collection mechanic one of the smoothest experiences, since you don’t have to swap between your tools to continue exploring and collecting. After some brief collecting, you’ll build your first shelter. You’ll take wood and use it to create doors, walls, a bed, and more. Your first safe abode will quickly be a welcome entity. Much like other builder games of this nature, the creepy crawlies will attack you when they have a chance, and they come out in droves during the night. The catch with Darkout, though, is that everything is dark, even during daytime, unless you light it up with torches and other devices of your own making. One of the unique and interesting things about Darkout is in its building system. With other games, you have to know how certain items are made and create them in formation. With Darkout, though, you simply have to have the required materials. With your background as a futuristic space traveler, much of the work is automated through the use of a device called a “Combinator.” The problem with this is that you must be near it in order to build the vast majority of items, forcing you to go back to base for anything but the absolute most basic constructions. Tied in with the construction is another new twist in the form of the Research system. 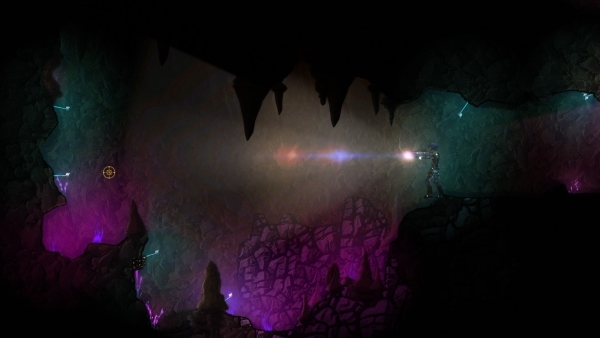 As you dig, kill indigenous life forms, and complete other exploration tasks, you’ll earn Research Points. If you have the required Research Points, as well as the necessary materials, you can research new items to build, which in turn unlocks even more to research. You’ll start off with basic building materials and work your way up to advanced weaponry, space armor, and even jetpacks and more! The variety of things you can learn to build is pretty solid and will keep you coming up with new things to track down time and again. For as much fun as there is to be had within Darkout, the current state of the game feels more like it should be in an Early Access program than a full and final purchase. One multiple occasions, I had the game crash or lock on me. Beyond the general concern of stability, though, there are usability issues littered throughout the game right now. There are basic pieces of functionality (such as picking up an item you’ve dropped) that required looking at an online wiki to discover. It can be a frustrating, trying experience working through the game. At the end of the day, though, it’s fun enough to continue. The game look quite impressive. With all of the special effects turned on, the lighting effects are quite impressive. 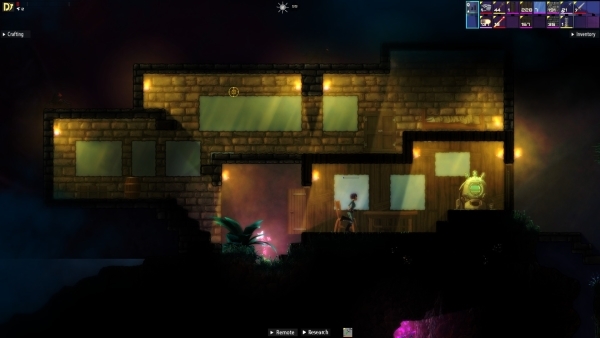 Plants give off an eery, colorful glow, torches and lanterns properly display light and cast shadows, and more. The movement and interaction animations feel a little clunkier than Darkout‘s cousins, but that’s not ultimately much of a concern. Overall it’s solid, but you should be prepared to play in a room that allows you to make out dark settings easily. The sound design ultimately feels a bit underwhelming. Most of the music is ultimately forgettable, though the menu music sounds reminiscent of the Mass Effect franchise. The sound effects and voice work all serve their purpose, but nothing truly stands out or excites. Overall, Darkout is a fun experience but it still feels like a game in its toddler stage. It’s beyond crawling, but it can’t sprint or jump like a trained adult can. The game looks great but it’s held back by lackluster sound design. It also has bugs that can cause system locks and crashes, and you’ll hit them all too often. 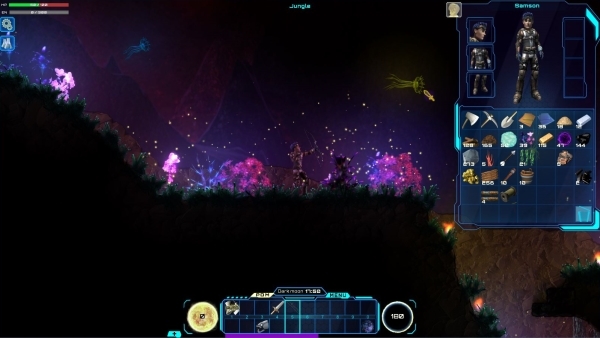 That said, the game is ultimately an enjoyable experience you’ll go back to if you give it a chance, but with competitors like Terraria and Starbound, you’ve got a choice to make.